John French, the legendary Magic Band drummer, has bought a new set of drums and hopes soon to be playing them on tour. We await an announcement about the name and line-up of John’s new band (this will not be a Magic Band tour). In the meantime John has let us know that after over twenty years of musical partnership with his Rogers Holiday drums he has decided that now is the time to let them go. 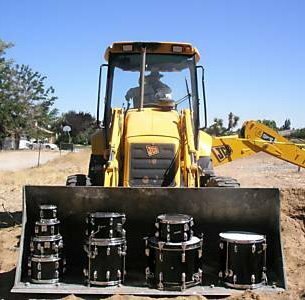 Here is your chance to become the proud possessor of a genuine piece of Magic Band / O Solo Drumbo / Crazy Backwards Alphabet / French, Frith, Kaiser, Thompson history. .
Can the lucky winner then expect a visit from John French delivering the drums in the shovel of his JCB (pictured)?